A prayer is being offered up in the hope Sunderland will enjoy Checkatrade Trophy success at Wembley. Club chaplain Father Marc Lyden-Smith has created the invocation ahead of tomorrow’s final as the Black Cats take on Portsmouth. Like many fans, he will be heading down to London by train today before taking his seat in the stands to cheer on the Lads. 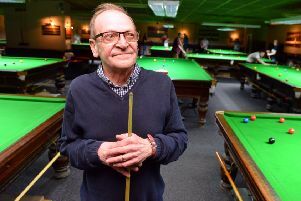 The priest, who is from Hebburn, leads St Mary’s RC Church in Bridge Street and St Cecila’s RC Church in Ryhope Road, which includes a number of players among its congregations. He made headlines the world over after previously presenting Pope Francis with his own Sunderland strip with Papa Francesco printed on it, and also serves as Sunderland University’s chaplain in addition to his club role. He is looking forward to tomorrow’s match and hopes he and fellow Sunderland fans will be heading home safe, happy, and with a victory to savour. Sunderland take on Portsmouth at Wembley. He said: “I can’t wait, I’m very excited and full of hope of seeing Sunderland lifting silverware. “And I really think we can do this. “The people of this great city really deserve this. “I know I’m biased, but I truly believe we have the best fans in the world. I know I’m biased, but I truly believe we have the best fans in the world. “Playing in the third tier of English football and still, we get huge crowds thronging the stadium of light with hope in their hearts, with passion in their bellies and pure loyalty and commitment in their souls. “We, the fans, deserve this. “And so does Jack Ross and the boss. Thousands of Sunderland fans will watch their side play against Portsmouth at Wembley Stadium in the final of the Checkatrade Trophy. “A team that so obviously buy into the history and ethos of this historic club. “And I’m so proud to be a part of this city and to follow this club, whatever happens during the match. It is such a privilege and a blessing for us to be in a cup final in such a special place. Please fill our players with energy and passion as they push themselves to do well. Help Sunderland to compete with fairness in their hearts and minds and give us the grace to accept whatever may come. Protect our players health and bodies as they challenge, tackle and run today. Watch over all those present, the spectators young and old, and our nearest and dearest families. May everyone who has travelled to Wembley all return home to Sunderland safe and happy. May this game celebrate sport, and be enjoyable for everyone.